2018 Tour Down Under winner Daryl Impey tops Patrick Bevin to win stage 4. Daryl Impey (Mitchelton-Scott) won stage 4 of the Santos Tour Down on Friday, moving him to within seven seconds of race leader Patrick Bevin (CCC), who finished the stage in second. Astana’s Luis León Sánchez took third and is 11 seconds back in the GC standings. The 129-kilometer stage from Unley to Campbelltown featured the challenging Corkscrew Road ascent as a final test some 6km from the finish. An early breakaway built a sizable advantage early on in the stage, but the pack swallowed up the move on the Corkscrew. Then came a flurry of attacks out of the bunch. 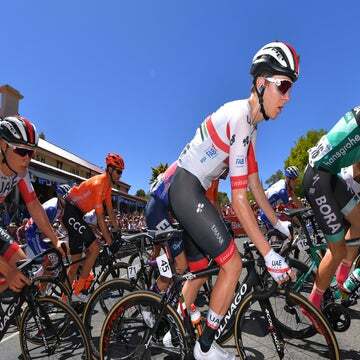 George Bennett (Jumbo-Visma), Wout Poels (Sky), Mike Woods (EF Education First), and Richie Porte (Trek-Segafredo) formed a dangerous group that led over the top of the climb, but the peloton caught the quartet inside the final 2km. Sánchez got off to a fast start in the ensuing sprint. Bevin overtook him on the finishing straight, only to watch 2018 overall winner Impey surge past in the closing meters to take the win. “I rode my own race. I knew I had Lucas there, I could see Paddy [Bevin] just in front so I knew if I stayed around that range we had a good enough group, that we were going to cooperate on the downhill, to try to bring those four back,” Impey said. “I just focused on my own climb and I was very happy to still be able to do what I did at the end. 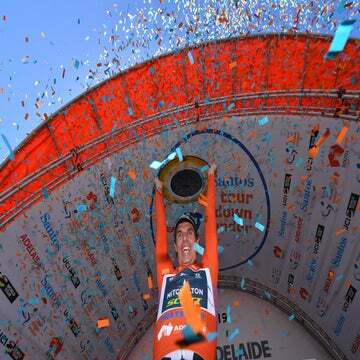 The Tour Down Under continues Saturday with the 149.5km stage 5 from Glenelg to Strathalbyn.